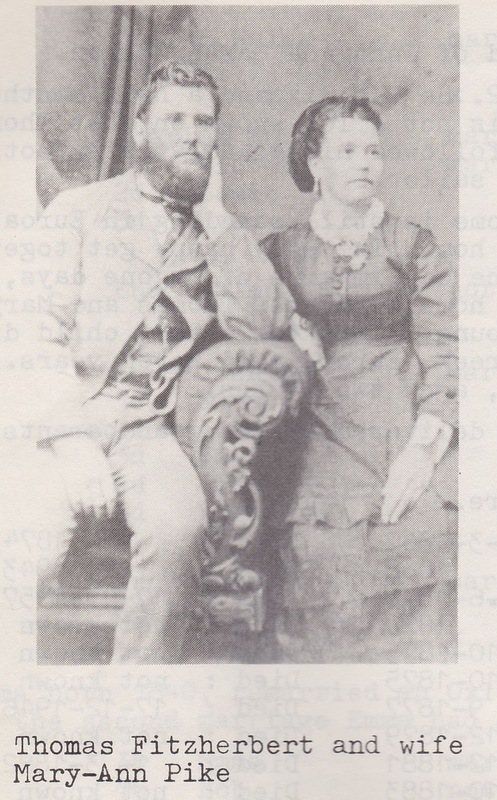 My maternal Great-Grand-Uncle Thomas Fitzherbert MORGAN and his wife Sarah MCNAY were married in Victoria in 1894. Thomas was born at Euroa in 1868, Sarah at Moonee Ponds in 1873. They had eleven children born between 1895 and 1918, eight boys and three girls who, all except one of the girls who died of Meningitis at the age of 12, survived to adulthood. One son, William was killed in World War One and another son Benjamin died in a German P.O.W camp in World War Two. 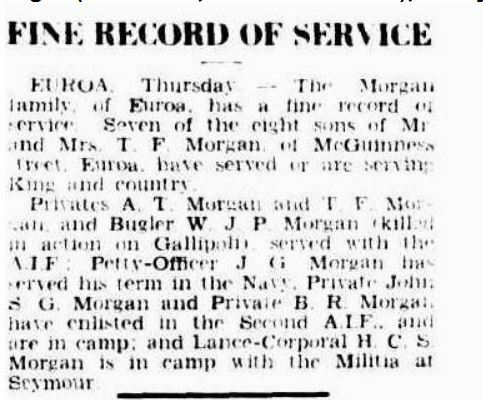 EUROA Thursday – The Morgan family of Euroa has a fine record of service. Seven of the eight sons of Mr. and Mrs. T F Morgan, of McGuiness street, Euroa have served or are serving King and country. 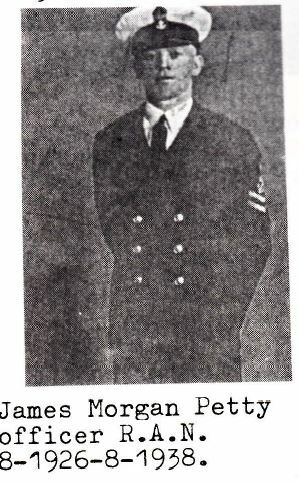 Privates A. T. Morgan and T. F. Morgan and Bugler W. J. P. Morgan killed in action on Gallipoli served with the A.I.F: Petty-Officer J G Morgan has served his term in the Navy. 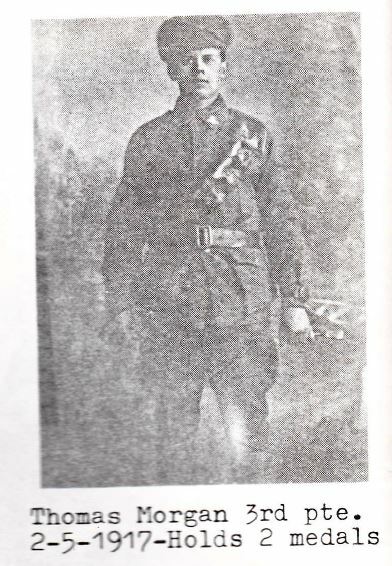 Private John S. G. Morgan and Private B. R. Morgan have enlisted in the Second A.I.F and are in camp: and Lance Corporal H.C.S Morgan is in camp with the Militia at Seymour. Born 1895 Euroa, died 1978 Euroa. Born 1899 Euroa died 1982 Heidelberg, Victoria. 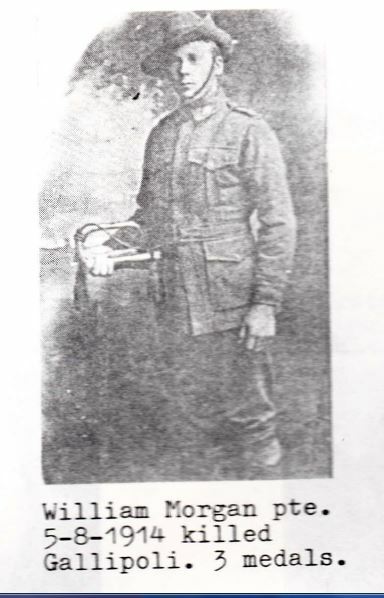 Born 1897 Euroa died 1915 at Gallipoli. Born Euroa 1907 died at Essendon in 1982. 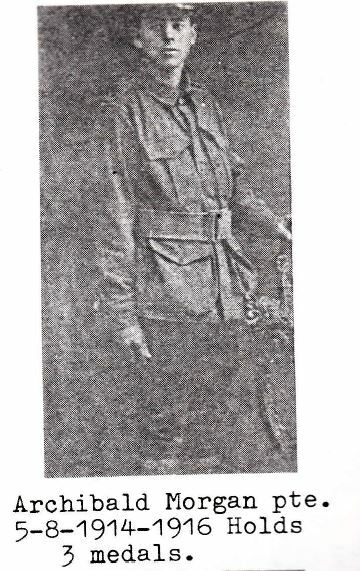 Sgt John Morgan born at Euroa, Victoria in 1918. 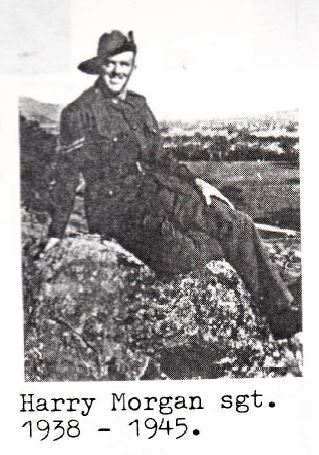 Died Tallangatta, Victoria in 2004. 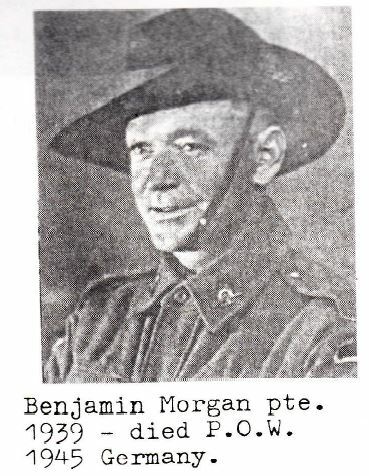 Benjamin was born at Euroa in 1910 died 1945 Germany. 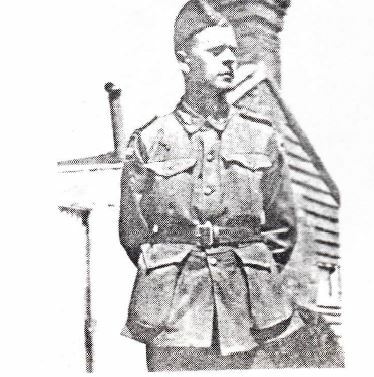 Harry Somerville Halliday Morgan was born at Euroa in 1912. He died at Heidelberg in 1976. Photos are from the Morgan Family Reunion book 1980 which was contributed to by many family members and compiled by Rhonda Morgan, then Payne. ← Mystery photo of unknown gentleman possibly solved?